What are the important role(s) of five key consumable parts? Heating Element Provides heat for sealing. Replace when it breaks, unevenness is generated, or the seal becomes messy, etc. Silicone Rubber Secures the sealing position. Replace when unevenness is generated or the seal becomes messy, etc. Teflon Sheet Helps to release the sealed bags from the heater. Replace when it breaks, burns, or the seal becomes messy, etc. Note: Teflon sheet is provided in sheet except for some models. Glass Tape Insulates the sealer body from the heating element. Replace when the heating element breaks often, the seal becomes messy, etc. NOTE: Glass tape is the Teflon sheet with the adhesive layer. It includes the width of 13mm, 19mm, and 25mm. Sarcon Sheet Provides enhanced insulation. Replace when the heating element breaks often, the seal becomes messy, etc. NOTE: It includes the width of 6mm, 10mm, and 13mm. The configuration of the sealing area for dual and single heating type of Fuji Impulse sealers are shown as below. The standard width of heating elements is 2mm, 5mm and 10mm, as well as the fusing type. The configuration of the heater terminals is changed for the modification of the electrodes according to the Product Liability Law. In this page, we will only introduce the shapes of heaters used mainly in our general-purpose products. 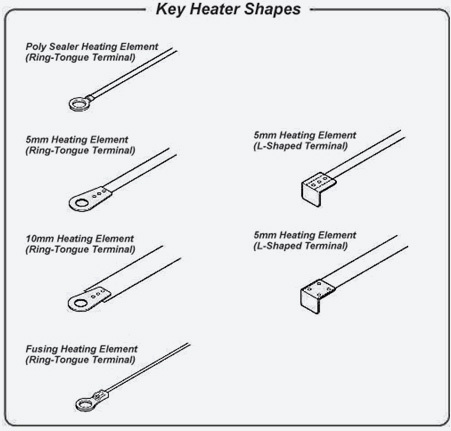 The four heating elements shown on the left are called “Ring-tongue terminal (or flat-shaped terminal) heaters.” They are characterized by the round hole on the terminal, designed for a heater-securing screw to go through. 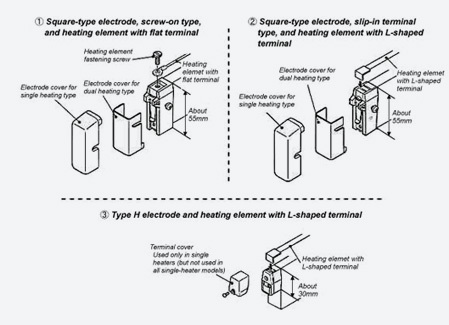 The heating elements shown on the right are called “L-shaped terminal heaters.” These heating elements have terminals that are bent in the shape of the letter “L”. This means that a 2 mm heating element may refer to either the ring-tongue or the L-shaped terminal, and the models that have the same name may not share the same heater (or the terminal) depending on the versions. Before the models were changed to comply with the new Product Liability Law, there were two types of electrodes: screw-on electrodes (for 2mm- and 5mm-wide single heaters) collectively referred to as gsquare-type electrodes,h and slip-in terminal electrodes (for 10 mm-wide single heaters, and dual heaters). The new models in compliance with the Product Liability Law are collectively called gType H electrodes,h and are used as a universal electrode in most of the general-purpose models, with some exceptions *(Note 1). *(Note 1) The square-type electrodes continue to be used in large machines, the CA Series, fusing types with sealing length of 600mm, and cut heater specification models (5C and 10C). Previously, this electrode was used in single-heater models, excluding the older model of 10mm-wide heaters. Today, this electrode is used in cut-heater specification models. This electrode was used in the older models of 10mm-wide single heaters and dual heaters. Today, this electrode is used in Fi-600Y, the CA Series, and large machines. exception of P series, FS series, Fi-600Y, the machines with fusing type heating element and large-size models. The microswitch notifies the timer that the clamping lever is down. A failed microswitch may cause one of the following two adverse affects. The heating will not start. distributing , resulting in a persistent heating state. The new microswitch has been used since 1994, replacing the old one for easy changeover and minimum risk of allowing accidental Switch-On by hand or some other causes even with the clamping lever in OFF position. When the machine is over-used and the timer is over-loaded, the heating time could get longer than pre-set time. Starting from 1994, we have adopted power switch with overheat-protection feature that shuts off the circuit.